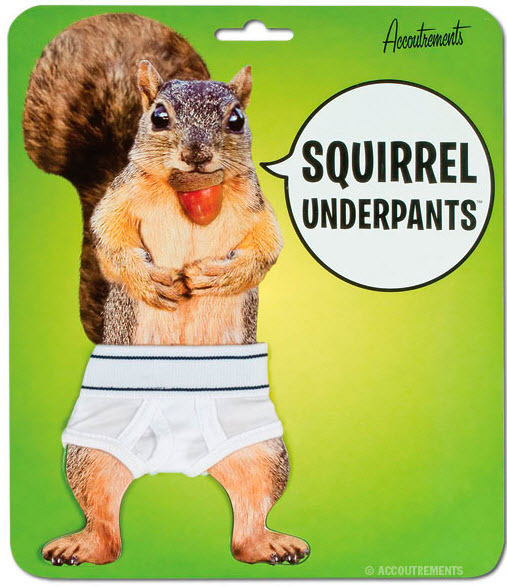 Underpants for those nasty, naughty, naked squirrels! Are you sick and tired of squirrels running naked in the trees around your house? Have you had to hide your children's eyes when a tiny furry streaker crosses the sidewalk in front of you? We've got the answer, Squirrel Underpants! Each pair of tiny briefs has a 3" (7.6 cm) waist and is made of 95% cotton and 5% spandex. Also good for hamsters, frogs, and gerbils. Illustrated card. Bagged.